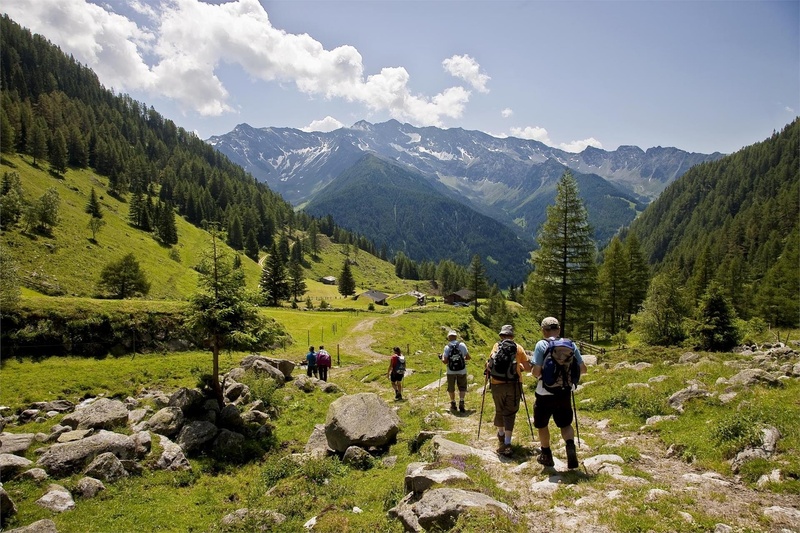 An enjoyable round-trip walk on the Hollenzberg… The journey itself is the reward on this tour plus the many highlights. Once you have mastered the steep ascent to the Hühnerspielhütten, a wonderful clearing opens in front of you, with the picturesque Hühnerspiel huts embedded in the alpine pasture. From there you can enjoy the view reaching from the Dreiherrenspitze to the mountain ridge on the orographic lefthand side of the valley. The Wollbach valley has maintained its unique character of a high alpine pasture and the whole valley is covered in pink during the blooming of the alpine roses. Walking along the vivid glacial waters of the Wollbach, we arrive at the alpine hut bearing the same name and back to the starting point. On the hill near the church in St. Jakob (1,192 m) we follow the road on the orographic right-hand side of the valley leading to the Bergerhöfe farms (signpost Hollenzalm). Alternatively, one can use the shortcuts n. 1–17. Above the farm Ebnerhof we arrive at a forest road and shortly after, we come to the branch-off, where we turn right onto the steep path n. 1 leading to the Hühnerspiel huts (1,910 m). The wooden cross there is noteworthy. Now path n. 1 continues on the left heading west, ascending slightly, to the lower mountain crest of the Wollbachkamm at 2,039 m, from there downwards to the Wollbach valley, to the Innerhütten (1,924 m) and eventually to the Wollbachalm (1,607 m). From this point we turn south-east and walk on forest road n. 5 for a bit heading towards St. Jakob, until we branch off on the right-hand side on path n. 5 which leads us down to St. Jakob and back to the start.